But it’s a complex statement. Eric lives by other numbers that transcend merely syrup. He was always an outdoorsman. Growing up, Eric swam, skied, and hiked. His employment at Proctor Academy began by leading 8-week, wilderness expeditions. He built his own timber-frame home, a tree house for his two girls, and, just for fun – a sugarhouse. 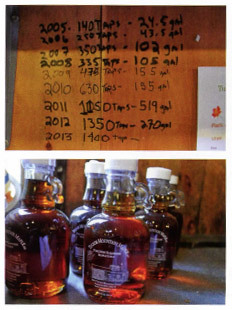 He founded Tucker Mountain Maple, LLC, now an award-winning maple syrup business. Eric chopped wood, worked as a logger, and spent countless hours fixing heavy-duty machinery. 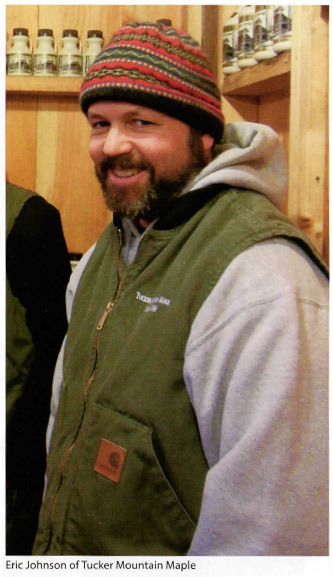 Eventually he became the Program Director for New Hampshire Timberland Owner’s Association, a position he still holds, running the professional logger and education program. He was fit, young, and almost-always healthy. But in 2011, Eric thought he must be out of shape. While playing a summer soccer game, he noticed an uncommon fatigue. He felt a little off-balance. Later that fall he noticed his hands were sometimes numb, daily tasks a little troublesome. Medical tests, however, were inconclusive. Finally, in November of 2012, a conclusive diagnosis came: Amyotrophic lateral sclerosis, or ALS, a progressive neurodegenerative disease that affects nerve cells responsible for voluntary muscle movement. Commonly known as Lou Gehrig’s disease, ALS has no cure. Though patients are living better and longer than in the past, Eric and was given more numbers -mortality statistics. Sitting in the kitchen of his timber-frame home, Eric says that progression is different for every person living with ALS. “Mine seems to be affecting my upper body strength and balance. In my neurologist’s opinion, I seem to be progressing on the slow side.” He optimistically taps his heavy maple counter top, always looking to what comes next. That includes the sugar business. Eric’s had to ask for more help. He’s had to delegate. In 2013, while Eric boiled and filtered in the sugarhouse, partners Mark Cowdrey, Dave Swanson, and Kat Darling picked up more of the heavy lifting. Eric relied on his two daughters as well, ages 13 and 11, to collect buckets of sap. “Every person with ALS needs to have a spouse as a biology teacher – it’s great!” Eric says. Heide, a Biology instructor at Proctor Academy, has not only been his support, but helps breakdown the overwhelming medical jargon. “Epigenetics, stem cells – how you turn them on and off – all the medical options and medical trials to decipher; it’s huge,” Eric says.